We’d love your help. Let us know what’s wrong with this preview of Kurt and Captain Annie by J.R. Hargrove. 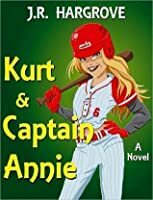 Kurt and Captain Annie is a coming-of-age young adult novel that features one very special girl, Annie. Kurt immediately befriends the new girl in town, Annie, and develops an immediate crush on her. But Annie isn’t interested in crushes, or boys for that matter. She’s an amazing athlete. So amazing that Kurt invites her to try out for the boy’s school baseball team. Well, Kurt and Captain Annie is a coming-of-age young adult novel that features one very special girl, Annie. Kurt immediately befriends the new girl in town, Annie, and develops an immediate crush on her. But Annie isn’t interested in crushes, or boys for that matter. She’s an amazing athlete. So amazing that Kurt invites her to try out for the boy’s school baseball team. Well, the boys are in for a rude awakening. Annie is good. So good that she’s better than all of them. So what’s a school to do when their best athlete is a girl? Easy. They make her captain. "Kurt and Captain Annie is a wonderful, heart-warming story. Mr. Hargrove is a fabulously talented writer who captures the exuberance of youth and the spirit of adventure. I've set this one aside to read again." "A book to be enjoyed by the whole family. A fun, fun story. I love this!" "What a sweet story! Highly recommended!" To ask other readers questions about Kurt and Captain Annie, please sign up.